Apply for a loan, and we’ll donate 100% of proceeds to fighting breast cancer. Here at Metric Mortgage, we’re fortunate enough to know and guide remarkable people from the community at a critical point when they’re making potentially life-changing decisions. For that reason, we believe wholeheartedly in reaching out and helping others in any way we can, like Jill Barber. If you live in and around Pasadena, you’ve probably met Jill. She used to work in Old Town. Jill is probably someone you have made eye contact with or maybe you have seen her smiling while helping others. 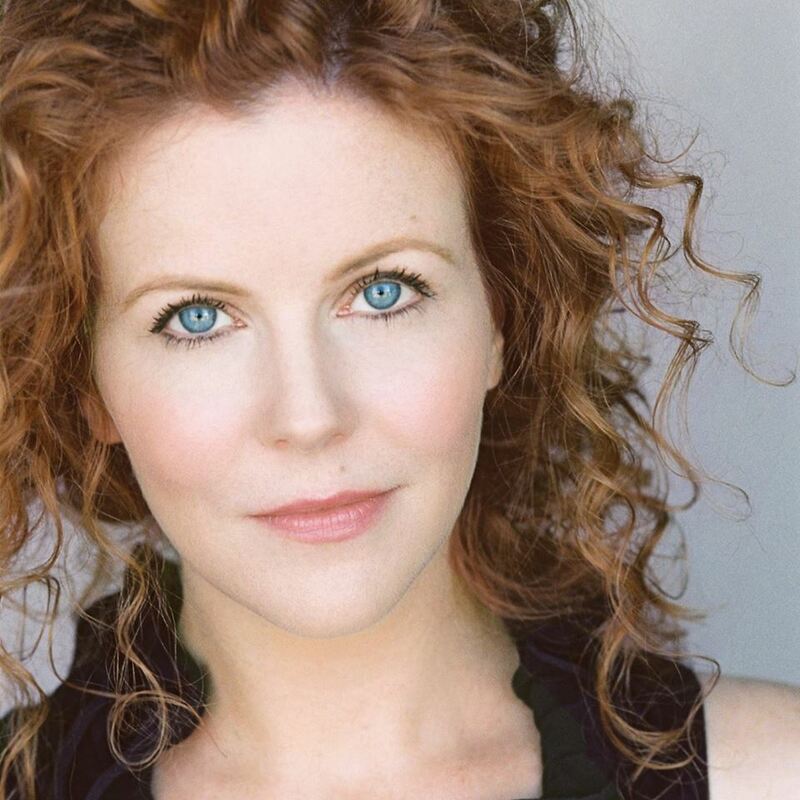 She has two college degrees and is a mother, actress, hard worker, and an amazing person. Jill is a close family friend of the owner of Metric Mortgage. Metric Mortgage would like to give back to the community by helping Jill with her mounting medical bills. If you are planning to buy a home or refinance your existing mortgage, we will donate 100% of the proceeds to Jill. Click here to apply now, or call 626-316-7289 ext 1, and Metric Mortgage will compete to get you the fairest interest rate possible. In doing so, you will directly help Jill continue her cancer treatments. 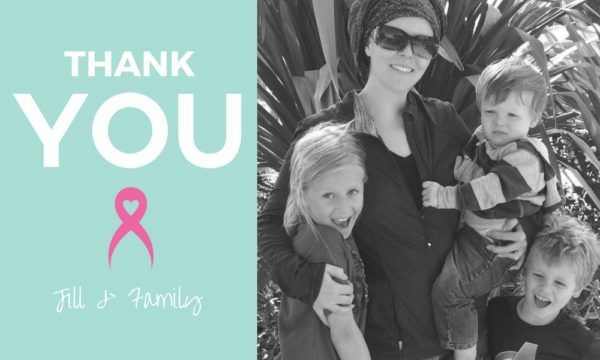 Jill’s doctors found two tumors in her left breast, diagnosed her with Her2-Overexpress, and her world went from mother of three working two jobs to a mother of three with no job, undergoing surgeries, chemotherapy, and doing her best to keep things as “normal” as possible for her children. 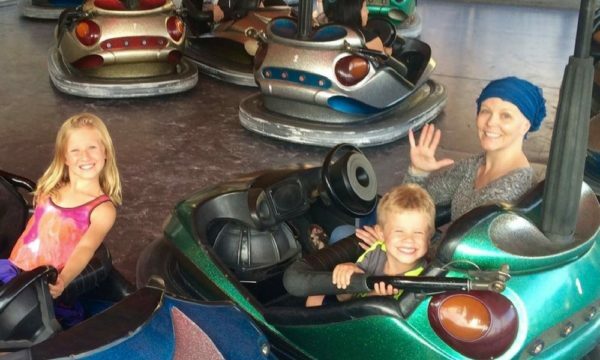 Below is a photo of Jill riding bumper cars with her two oldest kids shortly before her fourth round of chemotherapy. 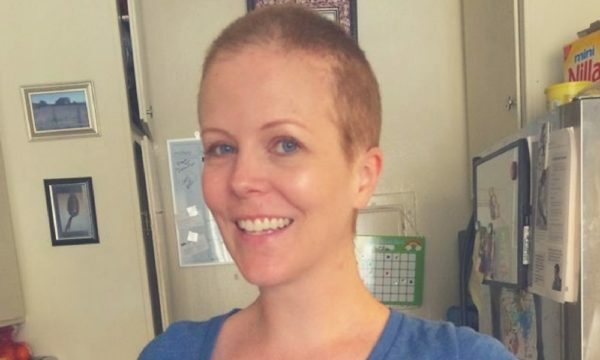 When Jill’s hair started falling out, she cried, dried her tears, then shaved her head, “channeling” the warrior spirit of Imperator Furiosa, Charlize Theron’s character in Mad Max: Fury Road. It isn’t often you meet someone like Jill, someone knocked down over and over by this deadly disease that means to take her life and sickened beyond description by chemotherapy every three weeks. However, on those days she can get out of bed, walk, hold down food, Jill takes her kids to birthday parties, goes on date night with her husband, even goes to the gym. Why? When most of us find “valid” excuses to skip the gym 360 days out of the year, why would she continue to exercise when her body is battling for survival? Who does that? Jill does. She refuses to give up the fight. Jill is no ordinary fighter. The kindness of strangers can turn the tide in the fight against cancer. We are happy to report that Jill has just had her first surgery and it went well! Her doctors have removed the cancer! However, her fight is not over. Her road to remaining cancer-free is long, expensive, and includes a team of doctors, numerous Herceptin treatments, a series of surgeries, and reconstruction, all while trying to support a family of five without the ability to work. Nevertheless, Jill is hopeful. Hope is powerful; there’s no denying it. We want to match her hope with financial relief, so her focus and momentum are not broken by worrying about the surmounting medical expenses–and they are substantial. 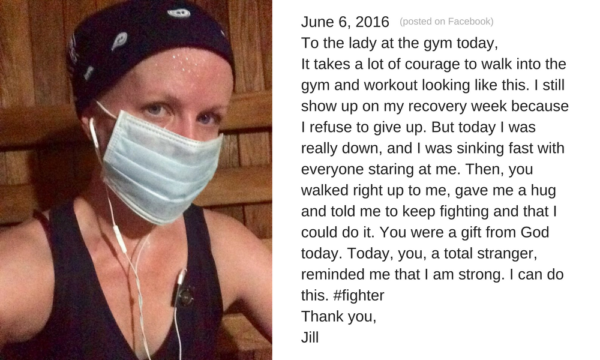 Jill is winning this fight, and she has to keep her spirits up for herself and her young family, but it hasn’t been easy. We can help them finish the fight. Metric Mortgage pledges 100% of the proceeds from the next new loan directly to Jill and her family. All of it. That means when you choose Metric Mortgage to broker your loan in California, you, too, are helping Jill beat cancer (at no extra cost to you). Feel free to contact the owner, Mark Hamilton, to talk about this joint effort to help Jill’s cause, visit Jill Barber’s GoFundMe Page, or apply now. Together we can help Jill and meet your mortgage needs.